The Autumn Sky Wrap is a quick and easy one-piece wrap. It features lacy ripples worked sideways and a light fringe for a fun design. Add fun buttons for extra personality! 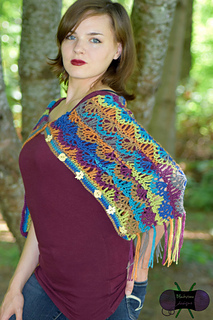 This wrap can be worked in any yarn weight. The length of the wrap is all that will change (and the amount of yarn needed).